In the 1830s, as the Trans Appalachian economy began to stir and Europe’s Industrial Revolution reached its peak, concerned Midwesterners saw opportunities and risks. 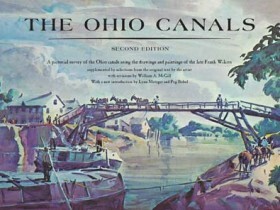 Success of the Erie Canal as a link to East Coast economic markets whetted the appetites of visionaries and entrepreneurs, who saw huge opportunities. Amid this perfect storm of technology, enterprise, finance, location, and timing arose some of the earliest railroads in the Midwest. Hoosier partisans’ independence, however, could not be easily brushed aside. Time and again they would frustrate the attempts of the Cleveland clique, exercising a degree of autonomy inconsistent with their dependent financial underpinnings. Ultimately, they acquiesced to the reality of their situation. After the Civil War, even the group from Cleveland fell victim to unscrupulous foreign and national financiers and manipulators who had taken their places on the boards of larger trunk lines expanding throughout the Midwest. 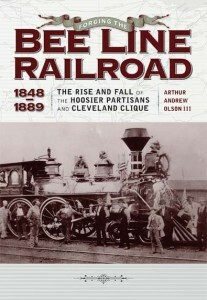 Exhaustively researched and meticulously documented, Forging the “Bee Line” Railroad, 1848–1889 is the first comprehensive scholarly work on this most important of early Midwestern railroads. AuthorArthur Andrew Olson III is a noted amateur historian who focuses on the Midwest’s pioneer era. Olson has authored several unpublished manuscripts that are archived in a research collection at Ball State University. His Anatomy of the 1818 Treaties of St. Marys and the “New Purchase” of Indiana and Pioneer and Civil War Era Indiana Politics: The Political Career of David Kilgore take a detailed look at key aspects of this important era. He holds a J.D. from Chicago-Kent College of Law, Illinois Institute of Technology.